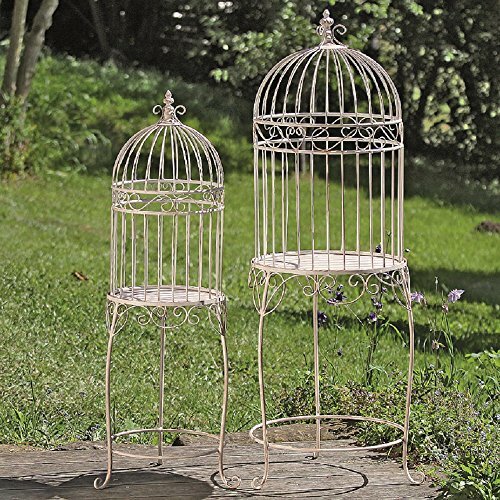 SOLD AS A SET OF 2 Add instant allure to your spaces with our romantic Farmers Market Vintage Style Plant Stands with lift off birdcage tops. This plant stand is designed to look like a reclaimed antique, beautifully crafted with period architectural elements and a weathered-distressed patina that whispers age. Place flowers, plants, candles, and more inside the cage to create fabulous displays. CRAFTED BY HAND Intricately hand worked by our artists, these unique pieces are made of metal and features delicate scroll-work on either side of the knob-finial atop the lift off cage. A pedestal stand table beneath adds height and allows this free standing piece to be placed where ever you like. Made look like a re-purposed up-cycled piece, the gorgeous patina with hints of rust peeks out behind the distressed paint. GREAT SIZES Well sized and beautifully proportioned, each piece measures as follows: 1- Larger - 17 ¾ L x 17 ¾ W x 49 ¼ H and 2 - Smaller 12½ L x 12½ W x 40¼ H inches. DISCOVER the longtime secret of brilliant decorators and florists and make magical displays with these incredibly versatile birdcages. Use them to showcase floral arrangements, candle displays and collections of your favorite things. An evergreen favorite of brides, our romantic bird cages are popular as wedding celebration card holders. AN IDEAL GIFT, it's perfect to celebrate holidays, birthdays, weddings and many more. So gorgeous, you'll want to keep it at home for yourself. Enjoy! By Whole House Worlds Welcome to the product line of Whole House Worlds. The New York based company offers high quality, stylish products for every room in the house, and beyond. From the kitchen, to the living room, to the bedroom, dining room, home office, closet and garden: Our criteria are comfort, quality, style and value. SOLD AS A SET OF 2 Add instant allure to your spaces with our romantic Farmers Market Vintage Style Plant Stands with lift off birdcage tops. This plant stand is designed to look like a reclaimed antique, beautifully crafted with period architectural elements and a weathered-distressed patina that whispers age. Place flowers, plants, candles, and more inside the cage to create fabulous displays. CRAFTED BY HAND Intricately hand worked by our artists, these unique pieces are made of metal and features delicate scroll-work on either side of the knob-finial atop the lift off cage. A pedestal stand table beneath adds height and allows this free standing piece to be placed where ever you like. Made look like a re-purposed up-cycled piece, the gorgeous patina with hints of rust peeks out behind the distressed paint. GREAT SIZES Well sized and beautifully proportioned, each piece measures as follows: 1- Larger - 17 ¾ L x 17 ¾ W x 49 ¼ H and 2 - Smaller 12½ L x 12½ W x 40¼ H inches. DISCOVER the longtime secret of brilliant decorators and florists and make magical displays with these incredibly versatile birdcages. Use them to showcase floral arrangements, candle displays and collections of your favorite things. An evergreen favorite of brides, our romantic bird cages are popular as wedding celebration card holders. If you have any questions about this product by Whole House Worlds, contact us by completing and submitting the form below. If you are looking for a specif part number, please include it with your message.